Have you visited the Field of Flags yet? We invite you to visit Draper Memorial Park in downtown Milford and walk through the glorious sea of red, white, and blue that honors our veterans and active military men and women. The Field of Flags will remain up through Flag Day (June 14). Each of the 110+ American flags has been sponsored by an individual, family, business, or local organization. We encourag e everyone who visits to read the names that are memorialized on the cards attached to each flag. 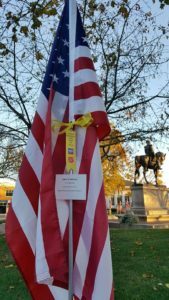 The flags are placed in alphabetical order, starting at the Park Street entrance to Draper Park and going counter-clockwise. Flags sponsored in honor of ALL VETERANS are placed behind the WWII Monument. Last-minute flag sponsorships are placed along Park Street, after the Zs. To download a map that shows the flag locations by first letter of each honoree’s last name, click here. Learn more about the Draper Memorial Park Field of Flags here.